… accept PERSONAL RESPONSIBILITY for creating the outcomes and quality of their lives. …see themselves as victims, believing for the most part that what happens to them is beyond their control. … discover a MOTIVATING PURPOSE, characterized by personally meaningful goals and dreams. …have difficulty choosing a purpose, often experiencing depression and/or resentment about the meaninglessness of their lives. … consistently plan and take EFFECTIVE ACTIONS in pursuing their goals and dreams. …seldom identify the specific actions needed to accomplish a task. And when they do, they tend to procrastinate. … build MUTUALLY SUPPORTIVE RELATIONSHIPS that assist them in pursuing their goals and dreams. …are solitary, seldom requesting, even rejecting offers of assistance from legitimate resources. … GAIN HEIGHTENED SELF-AWARENESS, developing empowering beliefs, attitudes, and behaviors that will keep them on course. …are slaves of disempowering life scripts that carry them far off course. …BECOME LIFE-LONG LEARNERS, finding valuable lessons in nearly every experience they have. …tend to resist learning new ideas and skills, often viewing learning as drudgery rather than mental play. …DEVELOP EMOTIONAL MATURITY, characterized by optimism, happiness, and peace of mind. …live at the mercy of their emotions, having their success hijacked by anger, depression, anxiety, and a need for instant gratification. …BELIEVE IN THEMSELVES, feeling capable, lovable, and unconditionally worthy as human beings. …doubt their personal value, feeling inadequate to accomplish meaningful tasks and unworthy to be loved by others or themselves. Do you have the habits of a successful learner? CLICK HERE to take a brief assessment and find out. Looking for an excellent career planning website? CLICK HERE. 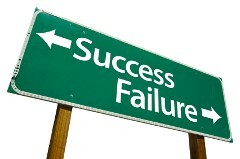 Contrary to popular belief, both success and failure are options. Choose wisely. In order to maximize success in psychology courses at Columbia States, students are urged to have very good reading, writing, and studying skills. The ability to think critically and reflectively is a plus! (“What is Critical Thinking?”) The topics covered in all of the psychology courses offered at Columbia State can be very challenging, necessitating an excellent study and work ethic.